These sweet little party favors will have your birthday guests smiling from ear to ear. 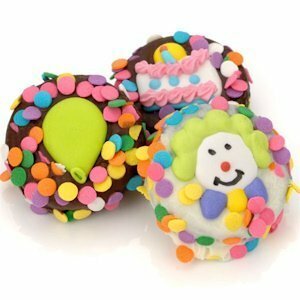 Chocolate dipped Oreo cookies are decorated with hand-made royal icing birthday decorations such as balloons, cakes, smiley faces, etc and/or a generous sprinkling of colorful candy confetti. We wrap each one in a clear heat-sealed bag to ensure freshness. Choose either an assortment of chocolate flavors or a specific one at checkout. Prices shown are per cookie favor and you must order at least 12.